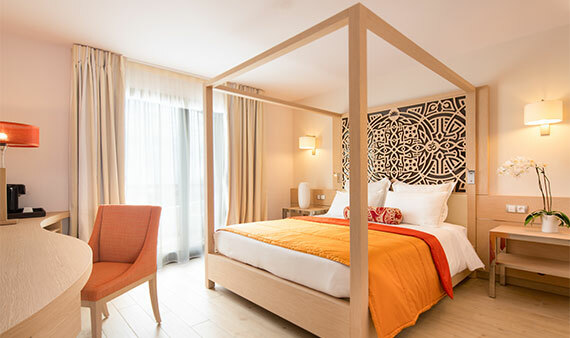 The nature and crafts of Reunion Island are highlighted in the “TROPICAL” rooms through a contemporary decoration scheme which bears the imprint of a whole host of decorative touches paying tribute to the Island’s traditional know-how. With its headboard braided with plant fibers and its light wood columns with sculpted pineapples hanging over them, the bed is the centerpiece of this theme. The bedside lamps with their outlines of popular sculptures, the sand and ochre colored fabrics, the predominantly green bed throw and the cushions with floral motifs complete this decor which manages to be both elegant and wild. 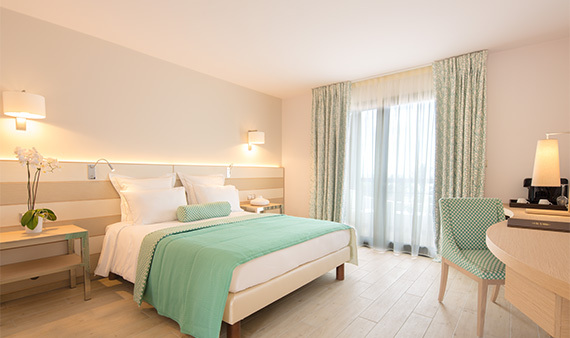 Named after the superb lagoon just a few steps from the hotel, the “TROU D’EAU” rooms are a hymn to nature, to sea spray, to white sand and to the beauty of the crystal clear ocean. So there are gentle sandy colors harmonizing with the curtains, embroidered with subtle foliage, and a headboard made up of strata with flexible lines conjuring up the depths of the sea. An emerald colored bed throw, reminiscent of the gentle toing and froing of the waves sparkling beneath the sun, round off this dreamy decor. 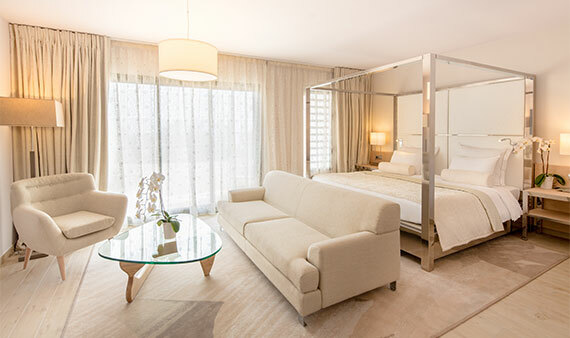 The Akoya pearl, a source of inspiration subtly present throughout the hotel, has pride of place in these suites which combine comfort, peace and quiet, refinement and purity. Soft colours, pearly glints and clear wood panelling deck out this natural, contemporary theme set off by cushions with floral prints. The pearl-inlaid headboard of the bed, framed by a chrome-plated canopy, appears to levitate within this sleep, airy setting, whilst chairs with reinvented vintages lines and a green bed throw lined with grey throw this soothing decor into relief. 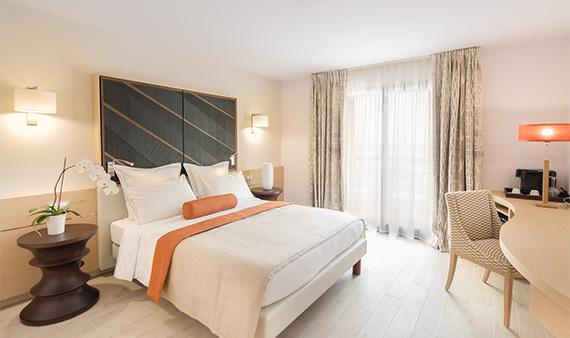 Inspired by the majestic peak of La Fournaise, its flora, fauna and the whole imaginary world which surrounds this amazing natural site, the decoration of the “FOURNAISE” rooms is based upon restrained lines and colors set off by subtler and more volcanic touches. The vanilla and bronze shades are thus combined with a headboard topped with a wood and leaf bas-relief, when the mirrors reflect the fire from the bed runner and cushions along with plainly ethnic motifs on the bedside tables and curtains. 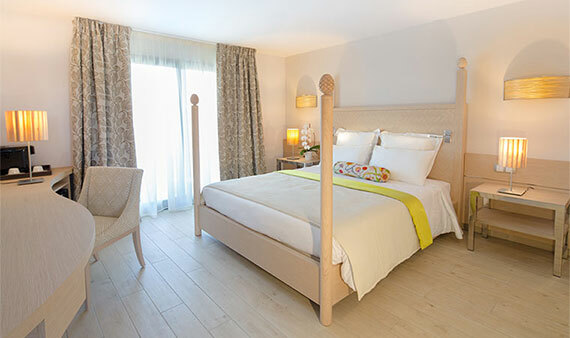 Dedicated to the Eastern culture which is one of the many facets of the Reunion Island identity, the “CHAMPS DE THÉ” rooms are decorated on an elegant, contemporary basis enhanced with allusions to Asia. Thus typical black and white Chinese vases and multicolored butterflies adorn the curtains which stand out in this ochre-tinted, silky, woody theme. The headboard is plainly decked out with a strip of fabric whereas the lined bed throw and the cushions offer tangier hints of color. Price of place here goes to the Indian harmony so dear to Reunion Island, through a plain, elegant decor thrown into relief by the imaginative colors which are typical of the land of the Maharajas. 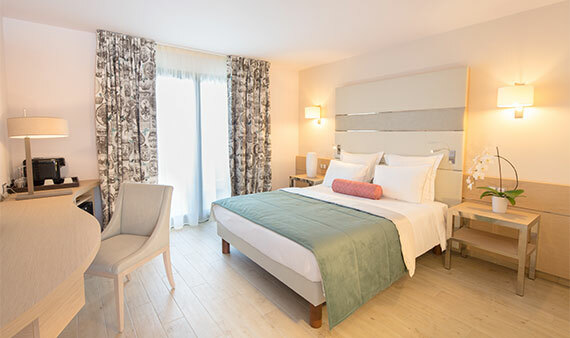 Thus combining modern, ethnic lines, the “NAMASTE” rooms are decked out in a majestic light wood canopy with geometric motifs and large bedside lights with “coral” glints. The white curtains and “sand” shades soothe the souped-up touches of this cameo with hints of saffron which is to be found on the cushions and lined bed throw.